The Hurlingham Yacht club approached us to fill their cast iron 20 tonne pontoon with foam as it had recently developed a habit of sinking!! 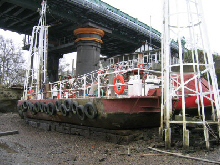 The pontoon is a 150 year old cast iron structure and is used for mooring. The pontoon has a fascinating history as it was purposefully sunk during WW2, to ensure that potential invaders were not able to make use of it. 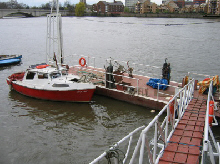 The pontoon is situated on the Thames at Putney Bridge. The Thames is a tidal river and hence the pontoon rests on the bed of the river every time the tide goes out. This presents a problem because of the amount of debris that tends to get washed up and down the Thames with tidal movements. The underside of the pontoon has been punctured several times from resting on one of the sharp objects washed down the river, and ended up filling up with water and sinking. 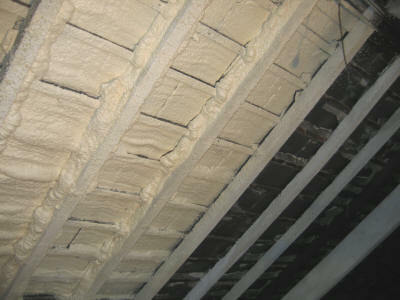 The solution: We filled the two end compartments of the pontoon with 38 cubic metres of foam, to act as a buoyancy aid. 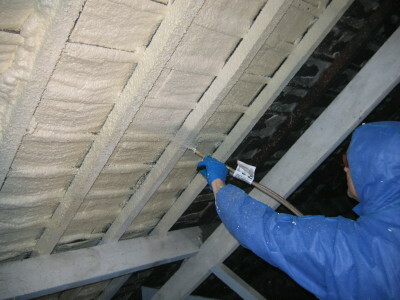 Although the spray foam was designed primarily as a thermal insulation product, it’s closed cell structure means that it doubles as buoyancy foam. The 38 cubic metres of foam, provides 36.7tonnes of lifting force, which is more than adequate to keep the pontoon afloat, even if compartment 2 (middle compartment) filled with water. 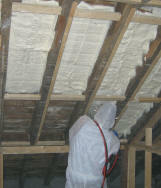 The lifting force provided by the foam is quite simply the volume of the foam less the weight of the foam – this gives an indication of what the foam will lift. For more information on flotation and Archimedes Principle follow this link. 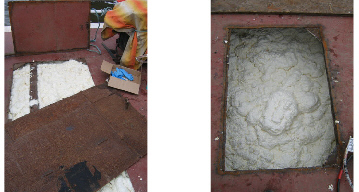 The first step in the buoyancy foaming process was to prepare the pontoon by cleaning and drying it out. The members of the Hurlingham Yacht Club graciously performed this task in preparation for us to fill it with foam. The second step was to heat the cylinders to 29 degrees centigrade. As the optimum spraying range is between 24 deg C and 29 deg C. As we had a great many cylinders to heat, we constructed a heating chamber and included a thermostatically controlled heater plus a fan to circulate the air. Last but certainly not least, we filled the two end compartments of the pontoon with the sprayed expanding foam. It was not necessary to fill all 3 compartments, as filling compartment 1 & 3 exceeded the amount of lifting force required to keep the pontoon afloat by a comfortable margin. The other advantage of only filling compartment 1 & 3 is that the club were able to save money whilst ensuring that the pontoon would never sink again. 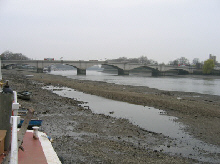 The Hurlingham Yacht Club is based on the the River Thames just a few miles upstream past the British Houses of Parliament. Over the centuries the Hurlingham Yacht Club has had an interesting and exciting history. The members originally formed the Club long before the First World War. The current name was adopted in 1922 and then in 1929 the Club moved into their excellent premises on the Deodar Road Thames Embankment, Putney. Hurlingham club now enjoys some of the best facilities on the River Thames. The members have the use of over 3000 feet of river moorings and a large 'all tide' pontoon berth at Broomhouse. At the club itself there is a visitors landing stage. This is foam filled and now unsinkable! There is also a brilliant dry-dock facility and lots of 'drying out' dinghy moorings.